There are countless photos of our star guests, because we all love them and want to remember the moments when we were close to them. This is also the case with the intimate portraits of our photographers Rafael Cantero Alonso de Medina and Daniel Dornhöfer, who present their work for the first time in the form of a vernissage at MagicCon. Look forward to big shots of your favorite stars and the experiences our photographers made with the actors in this little moment when they dropped the mask. Some of you may have met Rafael before. He has been working for FedCon GmbH for many years in various areas. No matter if he led actors through the area, lovingly crowded in front of you during autograph sessions to collect 50 autographs, or styled and laid out the FedCon INSIDER for a while – no matter in which area he was on the road, he has always stayed with us since his first hour: Our websites. With a great deal of commitment and design inspiration, he has been responsible for all con websites for many years. 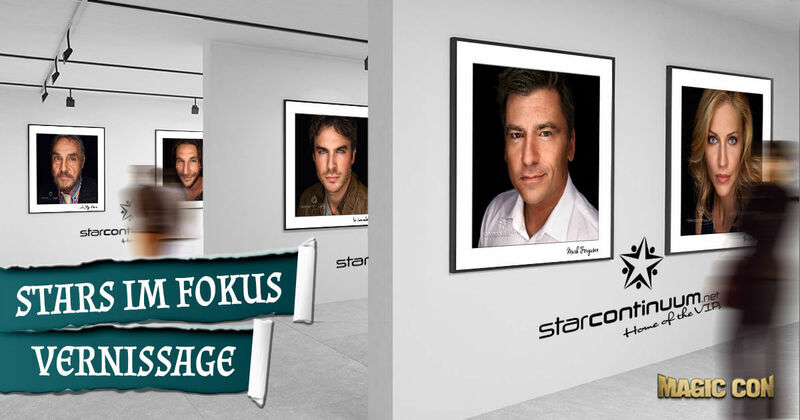 In 2010 Rafael founded his label starcontinuum.net in the course of a charity campaign and since 2014 he has also been photographing the invited guests in his very own way in the backstage area of MagicCon and FedCon. Besides his work for Hydra Forge, Daniel has been photographing the acting guests of MagicCon and FedCon since 2017. His style is oriented towards artists such as Van Meer and Rembrandt, as well as contemporary photographers such as Annie Leibovitz and Mark Selinger, thus creating timeless portraits. “With my portraits, I want to see the actor behind the mask, show people, make a part of them immortal, pay a small tribute to the fact that his work and art enrich my life and that of many other people”.